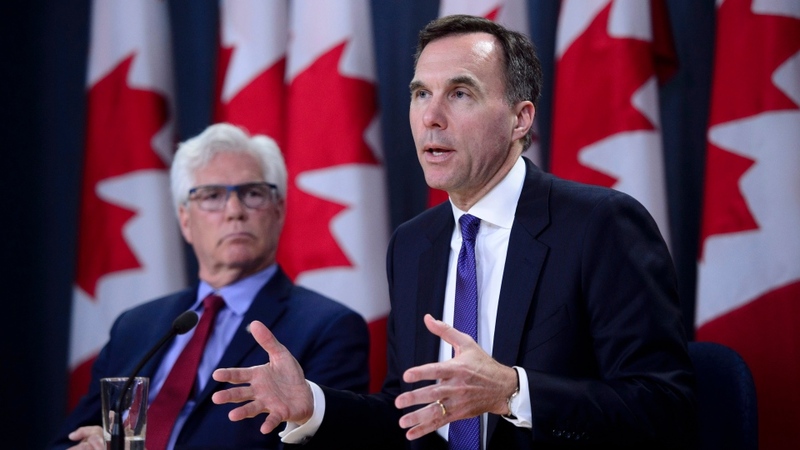 OTTAWA –The federal government announced Tuesday that in order to see the stalled Trans Mountain pipeline expansion built, it will spend $4.5 billion to buy the existing line from Kinder Morgan, and once the sale is finalized, will take on the remaining construction of the addition. The deal will see Canada become the owner of the cross-provincial pipeline and all of Kinder Morgan Canada's core Trans Mountain assets, through a Crown Corporation. Kinder Morgan will resume construction on the twinning of the pipeline as early as this week, with financial help from the federal government through an Export Development Canada loan guarantee, through the 2018 construction season. After the sale is complete—anticipated this August—the federal government will pick up the construction before selling it to a new "long-term" owner or owners, Finance Minister Bill Morneau announced alongside Natural Resources Minister Jim Carr in an early morning press conference Tuesday. Morneau said Indigenous groups, pension funds, and “multiple” others have expressed interest in the project. He described the $4.5 billion buy-out as a "fair price for Canadians," and said the commercial agreement is a "sound investment opportunity." “That's why we chose not to provide a subsidy to Kinder Morgan, but rather to enter into a commercial agreement that will make the most of the economic potential of this project. It's an agreement that we believe will deliver a real return on investment for the benefit of British Columbians, Albertans and all Canadians,” Morneau said. Additional spending on construction is anticipated, but the federal ministers wouldn’t speak to what the final price tag could be, other than saying it will involve a “user pay approach,” that sees oil companies chip in. The expansion had been estimated at $7.4 billion. In an interview with Don Martin, host of CTV’s Power Play, Morneau said he can’t reveal what those additional costs might amount to because it's "commercially sensitive information." "You don't put out those numbers while you’re in the midst of potentially talking to people. It’s like you don’t tell the person that’s coming in to renovate your house how much you want to spend in advance. You want to want to look for the bids to find out what the cost is," he said. The federal government will also offer financial security, or indemnification against any ongoing "politically motivated delays," to the new investors, while the Government of Alberta is offering an "emergency fund" of up to $2 billion to chip in on any "unforeseen circumstances," according to the news release. 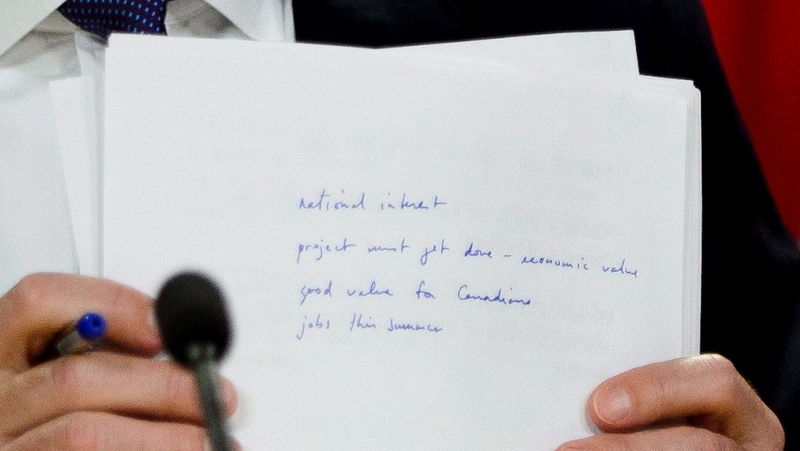 Morneau asserted that this purchase will have "no fiscal hit." The deal also allows the federal government to step back in and re-purchase the pipeline in instances of "adverse judicial decision," or if the new buyer cannot complete the project for other reasons. According to a Canadian Press report, the purchase includes the pipeline, pumping stations and rights of way along the route between Edmonton and Vancouver, as well as the marine terminal in Burnaby, B.C., where oil is loaded onto tankers for export. "We knew that to do energy differently in this country, we needed to act differently," Carr told reporters Tuesday. "The majority of Canadians understand that we are in a transition to a clean growth century and we will not get there overnight, but we will get there," Carr said. As the soon-to-be owners of the pipeline, the federal government says it is confident this closes the book on any question of whether or not they had jurisdiction, and no specific legislation will be required. "Our view is long-term that this project should be in the private sector. It has value, commercial value for a private owner. 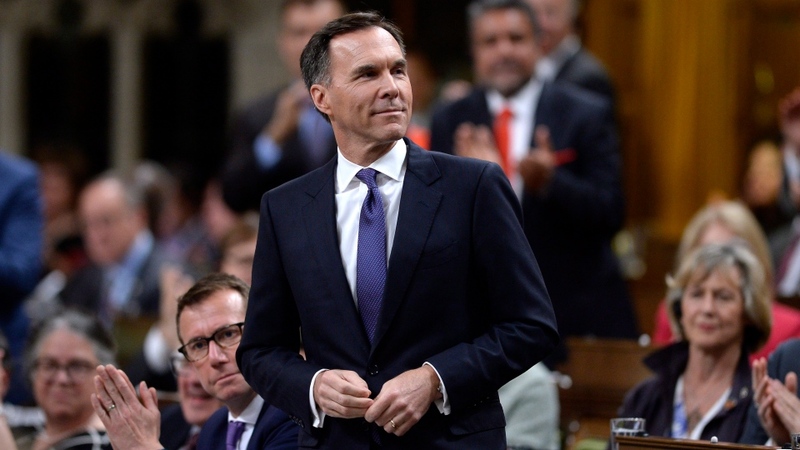 In order to get it done, we need to deal with the political uncertainty, and the only way, in our estimation, that that can be done is through exerting our jurisdiction by purchasing the project," Morneau said. Prime Minister Justin Trudeau spoke with both NDP Alberta Premier Rachel Notley and B.C. NDP Premier John Horgan about the federal decision Tuesday morning. In a tweet, Notley called the decision a "major step forward for all Canadians," pledging not to stop until the job is done. Albertans seeing value for any investment made. Notley and Horgan have been at odds over the pipeline, though she contested Tuesday that the whole ordeal was about B.C. taking "a run at the authority of the federal government and the interests of all Canadians." Horgan told reporters Tuesday that the federal announcement does nothing to reduce the risk of a diluted bitumen spill, and it "does not change the course that the Government of British Columbia has been on… I will continue to do my best to protect B.C. 's interests." The interprovincial spat between the two NDP premiers prompted Alberta to briefly cut off B.C. wine imports and threaten to turn off the oil taps. In response, B.C. has gone to the provincial Court of Appeal to see if it has jurisdiction to regulate heavy oil shipments. B.C. fears that a pipeline spill would be devastating for the coast, while Alberta insists that the expansion -- which already has federal approval -- is in the best interest of the Canadian economy. Horgan said the federal government taking ownership of the pipeline doesn’t change the essence of the reference case before the B.C. Court of Appeal, which he conveyed to Trudeau when they spoke Tuesday morning. On Tuesday morning the federal cabinet convened on Parliament Hill to hear Morneau’s plan to move the project forward, with public money. Morneau said cabinet approved the move, which now is before the company’s shareholders. 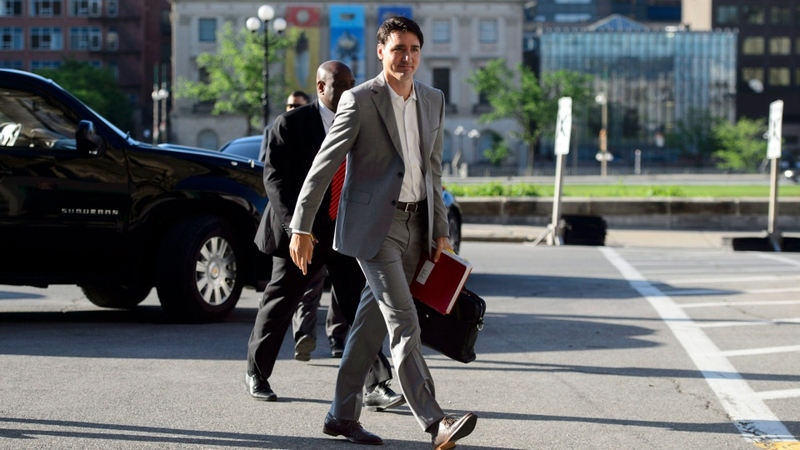 On their way into the meeting, few members of cabinet had anything to say about the controversial energy project, other than Trudeau who stated: "We're going to get that pipeline built." This decision comes days before Kinder Morgan’s May 31 deadline to get reassurance that the pipeline can go ahead. "We've found a way forward for this national interest project," said CEO of Kinder Morgan Canada Steve Kean on a conference call with reporters Tuesday morning. He said the company will work with the federal government on finding a third-party buyer, but the Texas-based company will be paid regardless. The expansion would triple the amount of oil transported from Edmonton to Burnaby, B.C., from 300,000 barrels a day to 890,000 barrels a day. The Trans Mountain pipeline has been in operation since the 1950s. The news of the nationalization of the pipeline dominated much of question period on Tuesday, with all sides pouncing on the Liberal’s decision. "All the company wanted was certainty, and today the prime minister is forcing Canadian taxpayers to pay for his failure," said Conservative Leader Andrew Scheer speaking to reporters in the House of Commons foyer prior to question period. Scheer strongly criticized the Liberals’ decision to buy the pipeline, paying billions to the Texas-based Kinder Morgan, and questioned how the plan aligns with the federal climate plan. He equated the move to Trudeau setting multiple fires and asking for kudos for buying a hose. "He's trying to buy his way out of a problem," Scheer said. Protests have taken place across Canada both for and against the pipeline. On Monday, Green Leader Elizabeth May was ordered to pay a $1,500 fine for her involvement in a March anti-pipeline rally at a main gate to Kinder Morgan's pipeline terminal. 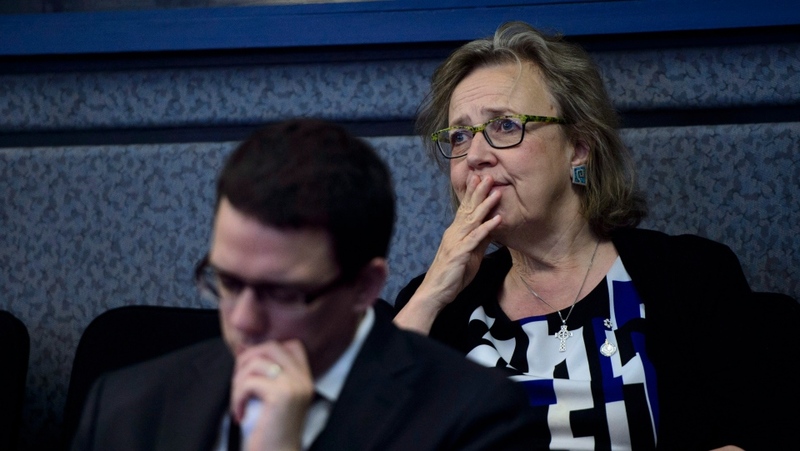 Tuesday on Parliament Hill, May expressed her concern with the environmental consequences, price tag, and cast doubt on the government's chances of finding a buyer. "Pull out your calculator and prepare to have your mind blown. Canada has just committed… an historic blunder with taxpayer dollars," said May. "It's absolutely stunning." NDP Leader Jagmeet Singh called it a “bad deal that won’t solve anything,” and questioned the generational longevity of the jobs this project will create. "This is about what kind of country Canadians want to build. Do we want a country that is stuck in the past? Focused on the short-term gains regardless of the risks? We don’t," Singh said. Several advocacy and environmental groups have slammed the government’s decision. "The public doesn’t back a big oil buyout, on the ground resistance will persist, and the Indigenous legal challenges to federal and National Energy Board approval are not concluded," said Council of Canadians spokesperson Andrea Harden-Donahue. In a statement from a group called "Protect the Inlet," Indigenous leaders say they are "preparing to escalate their frontline opposition," in light of the federal decision. "The answer is still no, we will never allow a pipeline to come through British Columbia and harm our Inlet," said spokesperson and Tsleil-Waututh elder Ta'ah Amy George. Though, members of the business community welcomed the announcement. "Not only will it enable our producers to get their product safely to global markets, where they can get a fair price, but it will also create thousands of jobs in communities across Canada. Additionally, it will generate billions in economic activity," said Canadian Chamber of Commerce spokesperson Alita Fabiano. This is a major step forward for all Canadians. We have met the deadline. This project has more certainty than ever before. We won’t stop until the job is done! This announcement means Alberta's Bill 12 is null and void given the feds own the existing pipeline that Notley was threatening to turn off. That possibility is gone so BC motorists will be spared major gas price hikes..
$4.5B / pipeline should be in private sector, will move back to private sector after construction and indemnify future investors of political interference / oil companies will pay to use pipeline. Crews cleaning up oil spill at Kinder Morgan station north of Kamloops, B.C.